The market for pillows is huge. Some are great for back pain, while some are better suited for neck pain, and some are just plain comfy. But today, we’re asking how pillows can relieve shoulder pain. We want to know what makes a great shoulder support system. Is it the memory foam? A good indication of how well a physical support system will work for your shoulder pain is how clinically sound the system is. That said, it would be a mistake to call the Bed Pillow Support System for Shoulder Pain a pillow, as it is doctor-recommended to relieve shoulder pain. Simply put, this makes it one of the best pillows for shoulder pain on the market. While the medium density is the most popular, the Bed Pillow Support System for Shoulder boasts a range of densities. For those weighing 131-300 pounds, the MEDIUM system offers a softer relief, while those weighing 300+ pounds may require the FIRM pillow, as it will provide the appropriate support. Whether you experience pressure due to shoulder injuries, surgery, arthritis, or any number of other shoulder strains, the Bed Pillow Support System for Shoulder Pain has you covered. However, you must sleep on it for 6-10 nights to properly break in the material, so don’t expect immediate results. This is certainly the most clinically recommended product on our list, and for that alone it is the most likely to relieve your shoulder pain. Plus its inclusive; regardless of your weight, Bed Pillow has a system for you. One drawback of the Bed Pillow Support System for Shoulder Pain is that the system needs to be broken in. So if you’re experiencing temporary pain, this might not be the system for you. Also, it ‘s meant to placed under your regular pillow, so the Bed Pillow itself is not a stand-alone pillow product. A great design makes for a great pillow, and in terms of design, this Mkicesky product is one of the best pillows for shoulder pain. With natural curves for neck and shoulder support, the Mkicesky Soft Memory Foam Bamboo Pillow ensures proper spinal alignment and helps open up airways to reduce snoring. It’s also great for a stiff neck and forces you into proper sleeping posture. Great material also makes for a great pillow. With high quality polyurethane memory foam with enough firmness to maintain support while still moulding to your particular contours, you can be sure that you’re getting the best material for your money. One encouraging thing to see nowadays is a 100% money-back guarantee. It’s great when companies have such confidence in their products. Now if this product isn’t for you, you can always try another one of the pillows for shoulder pain on out list. It’s well designed, comes with high quality material, and on top of that has a money-back guarantee. With this Mkicesky product, you’re likely to experience a very comfortable sleep will ensure a quicker recovery. It’s not doctor recommended. The Mkicesky Soft Memory Foam Bamboo Pillow might give you proper spine alignment and relieve tension in your shoulders and neck, but it doesn’t have the same level of clinical support as the Bed Pillow Shoulder Support system. While the Bed Pillow system is truly a physical support system, the Mkicesky is simply a very high quality pillow. Touch of Comfort’s brand claims that research has linked certain pains in the neck, upper back, and shoulders to cell phone use. Too much time on a cell phone allegedly disrupts the natural curve of the spine, so Touch of Comfort designed their Cervical Contoured Memory Foam Pillow with this particular pain in mind. Using a 2-in-1 wave shape, this Touch of Comfort product’s ergonomic design allows you to sleep higher or lower on the pillow, based on your personal preference or where the pain happens to be. In both cases, it forces your body to sleep in proper position so that your spine remains properly aligned. This exceptional design puts Touch of Comfort’s product in the running for the best pillow for shoulder pain available today. Touch of Comfort also offers a 7-year warranty on its product. With this, you can be sure that your Touch of Comfort Cervical Contoured Memory Foam Pillow will last you in the long run. It’s a good sign when a company puts this much confidence in their product. 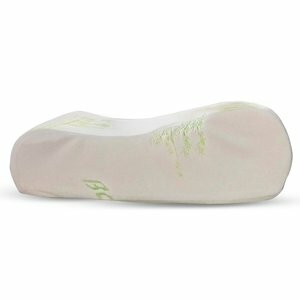 Simply put, the Touch of Comfort Cervical Contoured Pillow has a lot going for it. It comes with a generous warranty, encourages proper sleeping posture, and has a specific use that applies to a whole generation of cell phone users. Whether for shoulder pain, neck pain, or general comfort, Touch of Comfort has you covered. Much like the Mkicesky product, this Touch of Comfort item isn’t doctor recommended, so while it will likely give you a great deal of relief due to your proper spinal positioning, its not specifically designed to combat shoulder pain, or any other type of pain for that matter. Of all the nail printers we’ve reviewed, we picked the Bed Pillow Support System for Shoulder Pain as our top choice. This doctor-recommended support system won’t just give you proper spinal alignment while you sleep, but will give targeted should pain relief. Designed specifically to combat shoulder pain, this is the only pillow system on our list that is clinically tested.